To do this exercise you will need a mat. Start by lying on your belly with your elbows under your shoulders. Inhale to prepare and then exhale as you lengthen your neck and widen your shoulder blades. 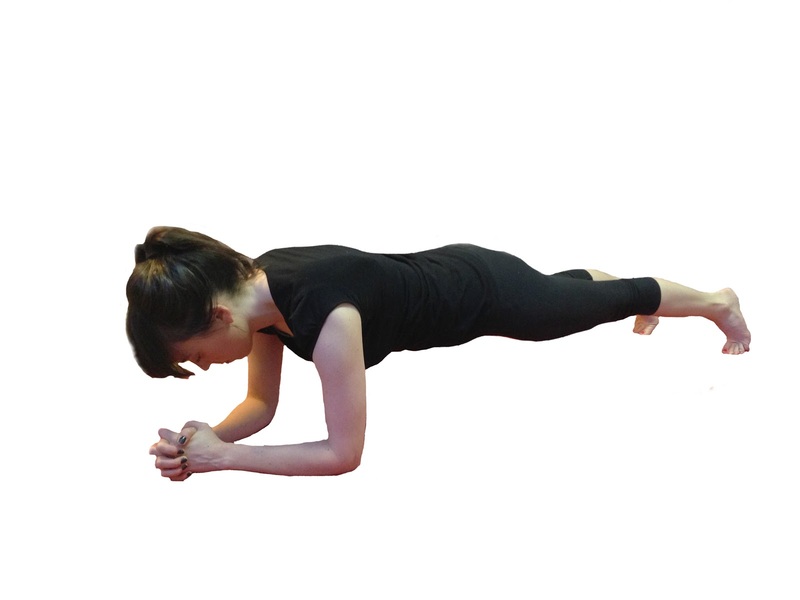 Inhale while maintaining this length and then exhale as you lift your sternum and your ribs. Inhale to maintain the new lengthen and then exhale as you lift your belly and your hips so that your spine is long and suspended between your knees and your elbows. Then Inhale as you curl your toes under your feet and finally exhale as you reach the heels away from your tailbone to suspend your knees in the elbow plank. Repeat 8-10 times. This exercise goes between two extremes. The exercise starts by allowing you to hang on your ligaments in a position that doesn’t feel so great, and then through a series of breaths you begin to find your myofascial system, which will suspend your bones within the balances tension of the muscles and fascia. Be sure that your neck stays long and that your shoulders stay connected to the hip socket towards the end of the exercise the tendency is to lost these connections.